While the U.S. Department of Justice report on racist policing practices in Ferguson, Missouri provides direct evidence for skeptical Whites that institutional racism is fact, limiting the investigation to Ferguson implausibly delimits the scope of race based repression in the U.S. Additionally, from slavery to convict leasing to funding the Ferguson city budget with fines and penalties overwhelmingly extracted from poor and middle class Blacks, the economic basis of police repression is isolated in an improbable present. And in fact, the ‘tricks and traps’ used by the Ferguson police for economic extraction closely resembles corporate practices of using contract law, state institutions and monopoly power to take economic resources from those who lack the social power to resist. A cognitive challenge for White Americans (and ‘conservative’ Blacks) is the distance between facts like police repression in Ferguson and the mythology of capitalist democracy that we live by. Use of the police for economic extraction in Ferguson, for funding the town budget through racial repression, ties state power to economic power within the particular circumstances of American racial and economic history. In a most basic sense this integration reframes state-market relations claimed to relate capitalism to democracy. More broadly, the TPP and TIPP ‘trade’ deals being pushed by President Obama are a variation on the racist shakedown in Ferguson. Their intent is to replace state power with corporate power while leaving Western states intact to provide state services for the benefit of corporations and the illusion of democratic control. Discovery of a police ‘black site’ in Chicago, the prevalence of racist violence by the police across the U.S., the return of debtor’s prisons and ‘civil forfeiture’ laws that allow the police to take belongings without evidence of a crime illustrate the growing lawlessness of the police. When tied to illegal surveillance carried out by the NSA, DEA and FBI against citizens and non-citizens alike and the extra-judicial powers claimed by Mr. Obama a picture of widespread state lawlessness emerges. When considered in the context of no criminal prosecutions for war crimes against the (George W) Bush administration or against prominent bankers in the financial and economic debacle of the last decade a picture of widespread elite lawlessness emerges. Clearly the state, including local police departments, exists for purposes other than enforcing fealty to the law. Based on supporting economic theories it is superficially ironic that the resurgence of neo-liberalism since the 1970s is coincident with this growing integration of state and ‘private’ power. Premised on clearly delineated state and market roles, neo-liberalism was / is in theory the economic realm unhindered by state restrictions. This state-market delineation facilitates the facade that capitalism is related to democracy— political freedom in the realm of the political and economic freedom in the realm of the economic. As fact and metaphor the role of the Ferguson police using asymmetrical social power to take economic wealth from vulnerable citizens demonstrates the implausibility of this theorized differentiation in the realm of the political. And new debtor’s prisons (link above) have police and the prison system acting as collection agents for Payday Lenders. The TTP and TTIP trade deals being pushed by Mr. Obama are designed with analogous levers for extorting wealth. The investor resolution clauses in TTIP have a supranational judiciary ruling on ‘investor’ lawsuits against governments for hypothetical lost profits and taxpayers on the hook for adverse rulings. The relative absence of remaining trade restrictions and tariffs is well covered territory. What remains to be accomplished with these ‘agreements’ is the consolidation of economic power as the power to extract wealth. As with proposals for tradable carbon credits, the ‘product’ of the agreements combines the right to extort by putting forward projects never intended to be built with guarantees against adverse economic developments. The police in Ferguson used a particular social lever, the residual of slavery, for gratuitous racial repression and for economic extraction. Slavery is a social institution, but it most particularly is an economic institution. It is a social mechanism for accruing the product of slave labor to the slave master. And slavery in the U.S. was ‘legal’ until it wasn’t. Convict leasing was explicit use of ‘the law’ and the judicial system to force poor Blacks to work for little or no pay. ‘The law’ was used as an instrument of economic exploitation and extraction. The push back from Whites and conservative Blacks that the murdered Mike Brown was a criminal because he likely stole a box of cigars takes this same law at face value. This view of the law depends on a similarly improbable separation of political and economic realms as neo-liberal theory. As political theory might have it, if all of the citizens of Ferguson were intended to benefit from city resources while poor and middle class Blacks were disproportionately forced to pay for them that represents economic taking by some citizens for the benefit of others. The racial character of this taking places it in history. The history of Western colonialism, neo-colonialism and imperialism places it in broader internal and external context. And this history is evidence that distinct realms of the economic and the political never described existing circumstance. The practical relevance is that it places the actions of the police in Ferguson, past and pending ‘trade’ agreements and global economic relations in the space where economic and political power act in an integrated social dimension. The effect is to reframe ‘the law’ in terms of who is committing particular acts rather than the acts being committed. The police in Ferguson can murder with impunity and shake down citizens at their discretion to fund the city budget (and their paychecks) while poor and middle class Blacks are disproportionately murdered and sent to prison for similar acts. What is legal and what isn’t is determined by who has social power, not by the acts themselves. In a racist and classist society the law is codification of class and race interests. If a black citizen of Ferguson puts a gun to someone’s head and demands their valuables they are a criminal but if the same act is committed by a cop it is within the law. Here events in Ferguson are fact and metaphor— overwhelming evidence (links above) suggests that similar social relations exist across much of the country. This view of the law has precedence in Richard Nixon’s contention that “when the President does it that means that it is not illegal.” Earlier precedence can be found in Nazi law and in the laws of fascist Italy in the 1930s and 1940s. This isn’t to call anyone who isn’t a self-proclaimed Nazi a Nazi. The precedence lies in the view that the law is the will of a leadership class, be it the Nazi leadership in Germany or city government in Ferguson. One problem with this theory is that it makes the law capricious and ultimately impossible to follow. Race based law enforcement criminalizes race, not nominally proscribed acts. Stories of the Chicago police department’s black site (link above) have political protesters and poor Blacks accused of no crimes taken there. If people can be arrested without evidence that a crime was committed then what is the difference in outcomes between committing and not committing crimes? A relation of neo-liberalism to fascism can be made through replacement of civil governance with corporate governance that subordinates the rights and privileges of civil society to corporate interests. The investor-state dispute mechanisms (link above) being broadened and formally codified in the TTIP trade deal will be used to demand compensation for environmental regulations that keep drinking water safe and limit greenhouse gas emissions, the metaphorical equivalent of threatening to end the planet if we don’t pay up. Civil forfeiture has the police taking valuables they might want at the point of a gun if necessary. The Ferguson police shake down poor Blacks using the law as a weapon. At the same time a ruling elite has immunity from prosecution for well documented crimes. Much of what is written here was well understood in the 1950s, 1960s and 1970s. It hardly seems an accident that this collective memory was lost to narrow ideological dogma. Across the country property taxes are being cut with partial differences made up through regressive fees and penalties. This fits the neo-liberal preference for property over labor incomes. And neo-liberal theory has no place for history because all acts within it take place in a temporally isolated present. This dissociates racist policing in Ferguson, Chicago, New York, Detroit and Philadelphia from the roles of the legislature, judiciary, police and prisons in reconstituting the economic exploitation of slavery under the guise of free choice in capitalist democracy. Race is the particular case in America; class is the broader expression of economic power. 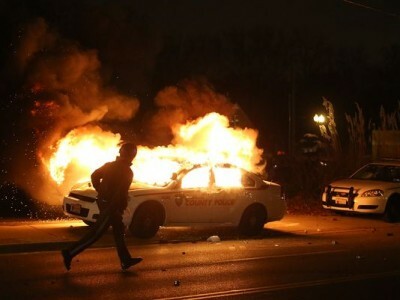 The tension between the DOJ report (link above) on racist policing in Ferguson and the Obama administration’s broad support for neo-liberal policies will likely produce a tight circle drawn around events in Ferguson. Already supporters of police repression are raising the argument that the words “hands up, don’t shoot” never transpired. What bearing does precise wording have on a Black child being murdered by the police? And why wouldn’t Black youth have a right to be hostile to police who, as the DOJ reports concludes, are running a racist shakedown operation to force poor and middle class Blacks to fund city government? How would White readers react to being harassed, intimidated, disproportionately jailed and forced to pay for the privilege? Ultimately the problem is larger than Ferguson and social accountability should address political economy premised in exploitation and social repression. Rob Urie is an artist and political economist. His book Zen Economics is written and awaiting publication.